Nashville’s Los Straitjackets are everybody’s favorite Mexican wrestler mask-clad instrumental surf-rock band, hands down! The band has been on tour recently with British rock legend Nick Lowe as part of his “Quality Rock & Roll Revue,” but they’ve somehow found the time to compile a new album for the upcoming holidays. On October 19th, 2018 Yep Roc Records will release Los Straitjackets’ Complete Christmas Songbook on CD and digitally; a vinyl version will follow on December 7th, which isn’t too late to add to your favorite fan’s Christmas list. Through the years, Los Straitjackets have released various Christmas albums and singles to near universal acclaim. 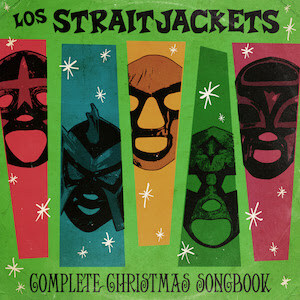 Los Straitjackets’ Complete Christmas Songbook includes the entirety of two previous LPs (2002’s ‘Tis the Season for Los Straitjackets and 2009’s limited-edition Yuletide Beat) as well as limited-edition singles, a song from Yep Roc’s Oh Santa! compilation disc, and a live performance of “Linus & Lucy” from the Straitjackets’ 2015 tour with Lowe. The album is now available for pre-order from Yep Roc and includes a six-ornament bundle that features each of the five band members’ masks on an ornament, and a sixth tree-hanger in the shape of a guitar. Check out the complete tracklisting below and either order the set directly from Yep Roc Records or head over to Amazon.com.